Animal studies suggest that the trace element nickel is involved in a number of important biological functions, including production of the hormones prolactin and aldosterone; maintaining the integrity of lipid and cell membranes; and stabilizing DNA and RNA, according to Andrew Weil, M.D. Low levels of nickel occur in people with liver or kidney disease. High levels of nickel occur in people with heart disease, thyroid disease and cancer, according to the Mineral Information Institute. The major source of nickel in the diet comes from plants, which supply about 900 mcg daily of nickel. 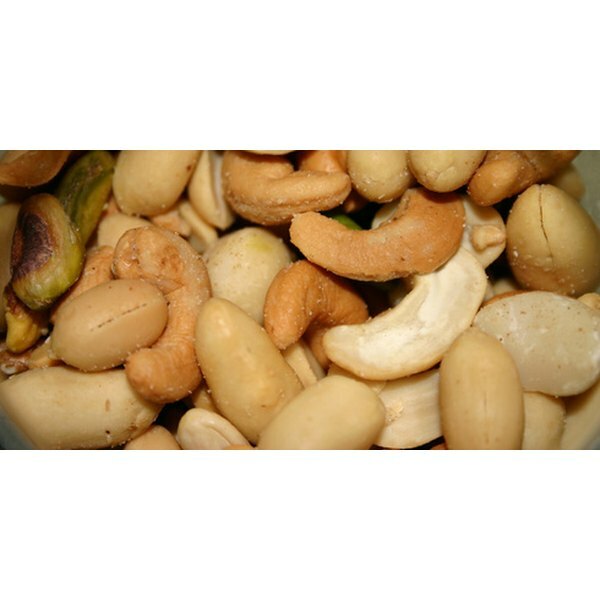 Dry beans, cocoa, baking soda, and nuts, including hazel nuts, almonds and pistachios contain high levels of nickel, or greater than 2.0 mcg/g, according to "The Journal of Nutrition." In Europe, nickel serves as a catalyst to harden margarine. Consequently, this food contains high amounts of nickel. Mushrooms, barley, rye, oysters, processed meats, raspberries and many vegetables contain intermediate levels of nickel, or 0.2- 2.0 mcg/g. Humans need 25 to 35 mcg of nickel per day, according to the U.S. Department of Agriculture's Agricultural Research Service. Average nickel intake in the United States is 300 mcg daily, according to the "Journal of Toxicology, Clinical Toxicology." Beer, tea, coffee, apricots, whole and dried milk, fresh fruits, meat, fish and Coca Cola contain low levels of nickel, or less than 0.2 ng/g. Canned fruit contains higher amounts of nickel than fresh fruit. This occurs due to fruit reacting with tin, which releases nickel. In addition, during cooking, oxalic acid in some foods attacks stainless steel skillets releasing nickel. Good quality stainless leaches these ingredients less than poor quality. Andrew Weil, M.D. : Getting Enough Nickel? Based in New Jersey, John Riefler has been writing since 1987. His articles have appeared in "MD Magazine," "Emergency Medicine" and "Hospital Practice." Riefler holds a Bachelor of Science in biology from Bucknell University, a Master of Science in microbiology from the Medical University of South Carolina and a medical doctorate from St. George's University School of Medicine. Can You Eat Too Much Kelp?